As I sat waiting for the Karnataka Express to take me from Gulbarga to Delhi, a man covered in grease approached me and asked me a few of the standard Indian questions: what is your good name? are you married? what is your job? Since I was unemployed, I was mercifully spared inquiry into my salary. His name was Basha. He asked me where I went to school -- Florida, I replied. "India is very poor country, we are having no education. Only two states are education giving, books giving, teaching giving. Kerala and Chennai, in Tamil Nadu are educaton giving. Many states, but others no, only Tamil Nadu, Kerala." I nodded in agreement. I'm not sure if he was strictly accurate ¡V that no other states provided education -- but those two southern states had a reputation for being well educated. He asked me where I was from. Chicago and San Francisco, I told him. "America where is your drinking water coming from? What rivers, what oceans?" "Ummm, the Pacific, Atlantic Oceans; the Mississippi River," I replied. I asked him if he had heard of the Mississippi; he hadn't. My journal had a world map in it; I showed it to him, and pointed out the United States and the two oceans (best to be safe) and then drew in a line for the Mississippi down through the middle of the U.S.
"My Gott! And your government is paying for travelling, some money giving?" "No, it's all my own money, I worked as a computer programmer to make money to travel, it's a good job." "My Gott!" he said, and then had a quick exchange with another Indian next to him that was in Kannada or Hindi, and involved the word "compooter degree" several times. "Are you a Muslim?" I asked. It seemed like a Hindu ought to be swearing by Krishna or Vishnu or something. He said he was, and then explained that he was working as some kind of computer technician for the train that was about to leave the station, and ran off to do his duty. 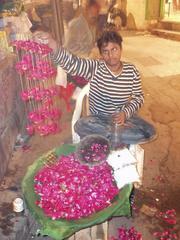 Boy selling rose petals for those asking for Nizam-ud-din's favor. I looked at the train. It wasn't mine; I was waiting for the Karnataka Express to Delhi, and this was a cargo train made up primarily of tankers with "Natural Gas 37.8 Tonnes, Not to be Loose Shunted, When Empty Return to Bajuwa" stencilled on them. I counted the cars -- 25 that I could see, possibly more: 10,000 tons of natural gas, if they were full. I was happy when they rolled out of the station, ever so slowly, five minutes later. The Karnataka Express showed up merrily on time; I had a 2 tier AC compartment, which was nice and spacious. I was stuck in the upper corner, which was next to the air conditioning duct, so it was somewhat chilly. A big bear of a Sikh installed himself in the opposite bunk and took off his turban, revealing a shaggy halo of uncut, graying hair -- one of the five kakkars, or emblems, of a devout Sikh, the other four being a comb to maintain their uncut hair, a steel bangle, loose underpants to indicate modesty, and a sword of some kind that made him look even more ursine. I felt like that was a sight that I, as a non-Sikh, shouldn't witness, like a Muslim woman removing her veil, but he didn't pay any notice to me. After we had started on our way, I walked back to sleeper class to sit in one of the open doorways and see Karnataka. It was dry. We passed a river bed at one point, where it was possible to see a few small pools of water that looked like they would evaporate within the hour. Two men were walking across a cracked field in the dying sun, walking their bikes on one of several paths that all seemed to lead to nowhere. fell asleep book in hand and woke up somewhere in the middle of Madya Pradesh, to breakfast in bed brought by the attendant. After that, I walked back to my open-air sleeper class again and sat in the doorway of the train, watching the heartland of India roll by, sipping Indian Railways chai. 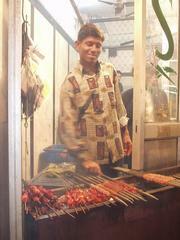 Muslim boy preparing sheek kebabs in the winding alleys near Nizam-ud-din's shrine, Delhi. There were fields of rice and soybeans, punctated by bursts of yellow from a crop that I could only get the Hindi name at the time -- "ya'oo" -- that I later figured out was mustard. Circular huts with pointy roofs dotted the landscape, and two herdsmen with red turbans, which doubled the circumference of their heads, prodded a herd of at least two hundred brahma bulls through a field near the track. Buildings with spires, made of brick and stone that I guessed were small-scale incinerators. A brown fallow field, into which a barrelful of monkeys seemed to have been emptied: rolling and fighting, poking and preening. Bushes in another field with crazed branches like silly string sprayed out of the ground. A wet field with filthy pigs and angelic cranes, foraging side by side. In sleeper class there is no security to keep out the assortment of beggars that seem to frequent public place in India. They tried different tactics to get me to pay them: one boy kept poking me in the hopes that I would pay him to leave me, another with a painted face who played the drums badly with similar intentions, an old woman selling cheap toys, and an old sadhu with an incense altar to some god, asking for donations. I arrived in Delhi on the next day, a Thursday. By now the day of the week was usually of little importance, but I was pleased that it was a Thursday, since I had recently read William Dalrymple's City of Djinns, his chronicle of a year in Delhi, in which he narrated his visit to the tomb of Nizammudin, a sufi mystic, where traditional qawwali singing occurred every Thursday. Dalrymple had hoped to see a whirling dervish, a sufi devotee overcome by the singing, but he was disappointed: but it sounded like a worthwhile visit, dancing or no. It was about a five mile walk to the shrine from where I was staying near the train station, which wasn't that much compared to the distances I had covered walking around Hampi or Mumbai. The first two miles were vaguely interesting, filled with the usual sights of shops selling everything from alternators to frying pans. As I went further south, further from Old Delhi and towards New Delhi, though, the streets broadened, the pedestrians dwindled, and I realized that I was in the Los Angeles of India, a city that was ruled by the automobile. As the sun set, the headlights of passing automobiles and autorickshaws cutting bright beams of white through the dark cloud of pollution that hovered over Delhi, belched out by factories and two-stroke engines. For two miles, I only saw two other pedestrians. I felt like I had entered some kind of post-apocalyptic television or movie set; around every corner, I expected to see the Network 23 tower from Max Headroom, or the Devil's Night fires from The Crow. Then there was a parking lot, followed by a small street leading off to the right, peppered with lights and filled with a milling throng of people. Many of the men wore small white skullcaps, and the women veils: Islam was here. I had traveled near the heart of Islam ¡V Istanbul to Cairo -- two years previously and felt quite safe, but with the continued strife in Palestine and Israel and impending conflict in Iraq, I felt a bit edgy. 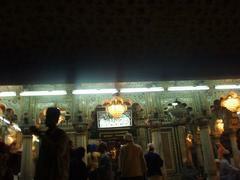 Then I reminded myself: these people are devotees of Nizamuddin, they're Sufis, mystics. The month before I left, I had visited an art exhibition in Detriot by Tom Block (tomblock.com) comparing the mystical traditions of Judaism (Hasidism), Christianity (Meister Eckhart) and Judaism (Sufis). The Sufi section consisted of little framed quotes of Sufis stuck up around the upper gallery, short paragraphs that read as if they had been written by Zen Buddhists that believed in God (Rumi: "Even though you tie a hundred knots -- the string remains one."). Sufism is banned in the more fundamentalist Islamic states: these people had to be safe. And they were all far too preoccupied trying to sell me kebabs and rose petals. There seems to be an unwritten rule in Islam that you can't have a proper holy site unless it's nestled deep in a warren of tiny alleys. The way to Nizammudin's tomb twisted and turned repeatedly, and was lined with shops selling books in Urdu, shawls, skull caps, and lots and lots of magenta-colored rose petals. "Stop shoes sir!" one of the rose-sellers called out after about the fifth corner, as if I would commit a terrible heretical act if I took another step. Two others slightly further in echoed his call, and all three of them had stands filled with sandals: it was apparently a profitable sideline to hang on to people's shoes while they visited the saint. I deposited my sandals with the nearest one. I walked barefoot through several more turns -- and past several more shoe-storers -- and past a small clearing with two tombs, like stone coffins that were one with the stones of the alley, and into the main courtyard of Nizammudin's shrine. A group was gathered around a group of musicians, and I stood on the edge; since I was a foot taller than most of the audience, I could see easily. There was one man singing and playing a battered brown harmonium that must have been around at the Partition of India. He was round-faced and balding, his teeth were broken and stained red from a lifetime of chewing paan, and he was wearing a white kurta suit: the overall effect was that of a lost cousin of the Munster family. His voice was gravelly but gentle, in a whiskey-and-cigarettes kind of way, and he sang passionately; ten other men flanked him and backed him up as a chorus. One right next to him was around twenty years old and sang with a clear, strong voice, pausing occasionally to sweep in the twenty and fifty rupee notes that accumulated in a pile before the performers. Another played a pair of drums. The musicians faced the shrine, and supplicants -- all men -- lined up to the right of the entranceway, heads covered and hands holding bowls of rose petals. They seemed to stay in the shrine for a minute or two, and then they backed out, bowing to touch the step of the portico as they did so. Many were dressed in Muslim kurtas, but then one with an Orlando Magic Starter jacket, and then one with a Subway USA jersey -- the sandwich chain -- walked in and back out. One man walked in with an orange three-pronged fork on his forehead, a mark of Shiva: Sufism -- or perhaps just Nizammudin -- seemed to reach, at least a little bit, over the barrier to Hinduism. I counted the Westerners in the crowd; there were four. One of them, a woman, tentatively walked out into the clearing in front of the musicians and dropped some rupees on the pile. After a moment, I followed suit, leaving fifty rupees. As I walked near the shrine, towards where I had been standing, a man with a massive ledger, the universal Indian sign of officialdom and authority, stopped me. The Bahai Temple of Delhi. "Would you like to make a donation?" he asked. He showed me his ledger, which had columns for name and address, and a wide variety of different things to donate to: maintenance of the shrine, food for the poor, and a "freeschool", whatever that is, among others. I donated a hundred rupees to the maintenance of the shrine, and asked if it was ok for me to enter the shrine. "Yes, but you should cover your head." "I don't have a hat with me." "You don't have a hanky or anything?" I went in, and it was very green. There was a large green sheet covering what appeared to be another stone coffin, which was in turn sheltered by a big green canopy, supported by stone pillars, as if for a large four-poster bed. Nizammudin's devotees orbited around the room clockwise, putting their rose petals on the sheet and then standing near the wall and muttering in prayer for a minute before moving on. Three people laid a smaller red cloth over the green one, where the blob of the tomb supported it, in what seemed to be another form of offering. An old man with a clean-shaven head, a beard that reached halfway down his chest, and a fervent look in his eye leaned far over the balustrade to kiss the tomb. Above the canopy, it seemed like there was a small room: perhaps where a guardian of the shrine lived? It was hard to tell. I made the orbit of the shrine and then squeezed out in a crush of people, some entering and some exiting, and then backed across the threshold like everyone else, touching it as I did so. No one had seemed to register my presence or even glance at me. I stayed in Delhi for four more days. I used the Lonely Planet bulletin board to arrange to rent a car for ten days with a Norwegian named Henrik -- $130 for each of us -- to see Rajasthan, but he wasn't going to arrive from Oslo for ten more days. I saw things around the city. 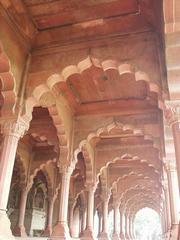 The Red Fort: grand-scale Mughal architecture in red sandstone, built by Shah Jehan. 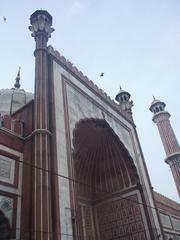 Jama Masjid: grand-scale religious Mughal architecture, also in red sandstone, also built by Shah Jehan. 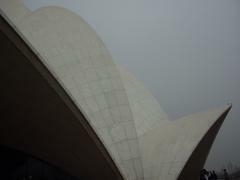 The Bahai temple: soaring curves in a 1970's kind of way; I guessed about two thousand people milling around outside, and fifteen actually sitting in the enforced silence inside. The Birla Temple: maroon and yellow oblong domes and freezing cold marble floors, but remarkable in that it was open to all castes. Old Delhi: small shops, cycle-rickshaw drivers straining to pedal through swarms of pedestrians. One evening, walking back from Old Delhi to where I was staying, crossing the bridge over New Delhi train station that was stuffed to the brim with people and vehicles, I noticed a woman walking towards me, going the other way across. At first I thought she was a Westerner, since she was too indecently dressed for an Indian woman, with her hair piled on her head, and a dress that was a little too low-cut. As she got closer, I noticed that she was looking at me, that her jaw was quite squaure, her chest flat, and her arms muscular. At the same moment that the word "transvestite" materialized in my brain, she called out "Halloooooo!" and casually reached out to grab my crotch. Before I realized that I had done it, I swatted her hand away forcefully, the result of a deep seated don't-grab-my-nuts reflex of which I had hitherto been unaware. I would have been totally bewildered, had City of Djinns not prepared me, but as it was I burst out laughing after a moment of shock. "She" was a hijra, one of a group of eunuchs that constitue a separate, tightly-knit social class. Dalrymple spent a great deal of time and effort trying to court some of them -- in a journalistic sense -- and finally succeeded in talking to some of them in their homes. They also made an appearance in Vikram Seth's novel A Suitable Boy where they appear in their conventional role of visiting wedding receptions and playing loud, obnoxious music and harassing guests until the host pays them a large sum of money to leave. The Diwan-i-Am of the Red Fort, up close and personal. Having survived that encounter and seen the sights of Delhi, I couldn't really think of anything to do for a week in Delhi, and the thought of the amount of pollution I would inhale in that time was depressing. 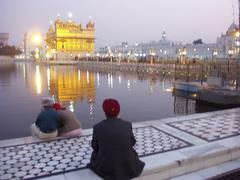 I bought a train ticket for Amritsar, where the Golden Temple serves as the center of the Sikh religion. I knew when I arrived at the Golden Temple that they offered free food and lodging to all pilgrims -- which includes non-Sikhs -- but it wasn't immediately evident where it was. There were many people walking in and out of the complex, many wearing "Golden Temple" bandanas to fulfill the head-covering requirement, but it seemed wildly inappropriate to walk in with a massive backpack. After some exploration, I found a baggage check near the door. The attendant seemed mildly annoyed to have to haul in my fifty pound bag, but he complied. I bought a bright orange bandanna, tied it around my head, and headed through the gate to the temple complex, which passed through a massive white marble wall. As I did so, I stepped in what was like a miniature moat of freezing cold water, provided to allow people to wash their feet as they entered. The Golden Temple complex was one of the most amazing places I saw in India. The Taj Mahal, for all of its architectural merits, was like a dead husk being chewed over by hordes of tourists compared to the vibrancy of the Golden Temple, which was obviously still the pulsing center of a religion. The structure itself is gilded with over 100 kilograms of gold, and is surrounded by a wide pool called the Amrit Sarovar, from which the surrounding city took its name. There is a pathway around the pool, which is about a quarter of a mile around; several other temples are in the same complex. The causeway across the lake was filled with a line to rival that at Space Mountain in Disneyworld, except it was all Sikhs, waiting with food offerings in hand to bring for blessing into the temple. I queued up. All the way around the pool Sikhs walked clockwise around the temple. They ran the gamut from bearded, wizened old men, dressed in bright orange and carrying pikes and spears, to families that seemed to have come from America or Europe to show the kids where their religion came from. Some of them paused and talked; a group of old men were grouped around a book and half-chanting, half-singing what they were reading in it. The wall had a colonnaded walkway in it, and some people -- again, mostly old men, with wrinkled faces that exuded character -- sat in listless meditation, looking at the temple. The sun, sinking slowly into the west, turned the temples gold to bronze. After half an hour, I was admitted to the temple, which was similar to Nizamuddin's shrine: the supplicants went to a central area, surrounded by a balustrade, within which there were attendants who took their food offerings, blessed them, and gave them back. Four elderly, bearded men kept up constant chanting that was played throughout the complex of the Guru Granth Sahib, the Sikh's holy book, and they were engulfed in a mass of microphones and mixing boards worthy of a commercial radio station. I had presumed from the crowds outside that the interior of the temple would be packed. The central area was filled with those seeking food-blessing, but the upper balcony was relatively empty, which people sitting in the windows and gazing out at the pool. One young but devout-looking man sat reading a text. Only a handful of people went up to the roof, where it was possible to take in the whole scene of people orbiting around. Looking upon them, it was hard to imagine the violence of nineteen years earlier, when Indira Gandhi used military action against Sikhs occupying the temple, demanding a separate Sikh state; "Operation Bluestar", although successful, motivated Indira's Sikh bodyguards to assasinate her shortly afterward. On the way out, where the causeway across the pool ended, a man was handing out a doughy paste to everyone. I started to walk by on the far side: I was never certain how involved people wanted unbelievers to be in the motions of their religion. But the man called me over, and motioned for me to take some, and to eat it. It was sweet and tasty, probably made from milk, grain, and sugar. After slow lap around the temple, I found the gurdwaras on the far side, where supposedly all pilgrims were granted free accomodation. I fetched my backpack -- brought back out my two of the attendants -- and walked back around. After a brief misunderstanding with the orange-clad, pike-wielding attendant (foreigners are placed separately from Sikhs), I settled in; it was a triple room with two other backpacks, but neither of the owners. The Guru Ka Langar is a massive kitchen that serves 30,000 meals a day to pilgrims. People were milling about outside when I went looking for a bite to eat, but the gates were closed. No one seemed to speak English, but one man indicated that I should wait. I studied the signs over the door, which, juding from the pictures, exhorted the faithful to not cut their beards. Eventually the doors opened, and we poured in and sat in lines on either side of long straw mats that ran the length of the hall. When all were settled, a young man in his twenties stood up. He had the beginnings of a beard and a black piece of nylon covering his hair, which was tied into a knot on the top of his head. "Swateth nah nawaheh guruuuuuu," he intoned. "Swateth nah nawahah guruuuuuu." "Swateth nah nawahah guruuuuuu," replied the hungry faithful. The chanting  the same line repeated  lasted ten minutes while other turbanned men walked down the mats, giving each person two chapatis and a bowl of dal. After all had been served, and a few more extra minutes of chanting, the prayers were brought to and end with a few quick claps and the eating began with a great deal of clatter and slurping. The food was simple, but the dal had a pleasant taste of black pepper to it, and seconds and thirds were brought by in abundance. One emaciated looking man across from me obliterated his first share in what must have been record time and was replenished with more chapatis and dal dropped unceremoniously from the serving men walking by, which vanished just as quickly. Like with the traditional Indian all-you-can-eat thali, it was necessary to physically defend your plate and bowl, covering it up if you didnt want anything to eat. 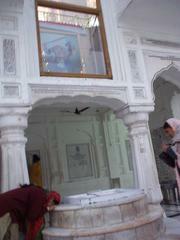 Woman paying homage to Guru Deep Singh. The crowd dribbled out into the night as they finished, handing their plates to the volunteer crews that were washing them off.